One time, I craved for pancit. It was a good timing that my ex-office mate invited us for an eat out. And since I was craving for pancit, she suggested to eat at Buddy’s Pancit Lucban. The restaurant has branches in Metro Manila. Good thing there’s a branch located nearby. But it wasn’t really near as it took us 20 minutes to walk to get there. But anyway, there was a lot of customers waiting when we arrived. It only shows that this restaurant serves real good food. We took our orders and paid it at the cashier. Then we just waited for our turn. Afterwards, a table was already available for us. The store is quite small as it can only accommodate 20 persons or less. Nevertheless, it was the taste of the food were after for. It didn’t take long for our orders to be served. 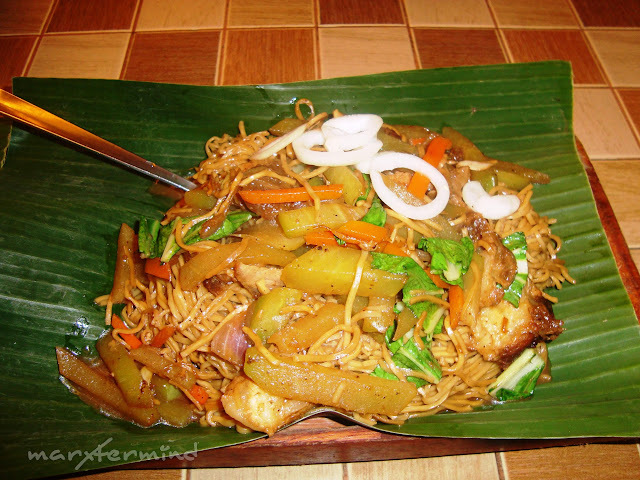 We ordered 2 Pancit Lucban good for 2 – 3 persons for PHP 155.00 each. We ordered 2 orders of it since we thought it will not fit for all of us. But 1 order of it is already good for 4 – 5 persons (depending on the appetite). If some pancit is great with Philippine lemon, then this pancit tasted so good with vinegar. Drizzle some vinegar and it improves the taste. Then my office mate told that this should be eaten without any utensils on hand. Then I got confused, isn’t it Pancit Habhab? I searched it online and found out that Pancit Lucban and Pancit Habhab are somehow similar. 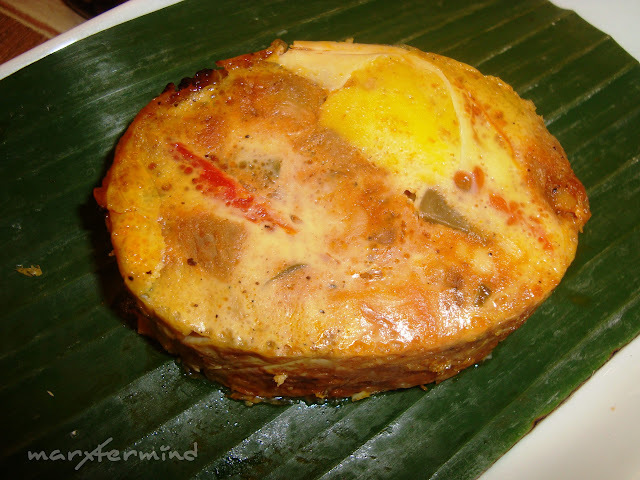 These are local delicacies and specialties of Lucban, Quezon. 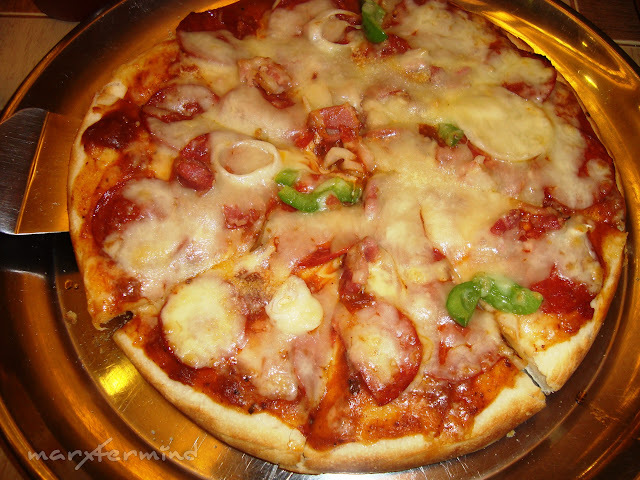 The pizza is so Pinoy style but I like it though. I thought pancit and pizza were not enough for my hunger so I bought Hardenera and rice. It was highly recommended by my office mate so I tried it. It looks like menudo cooked as omelete. And the taste? It was OK and it tasted like menudo. 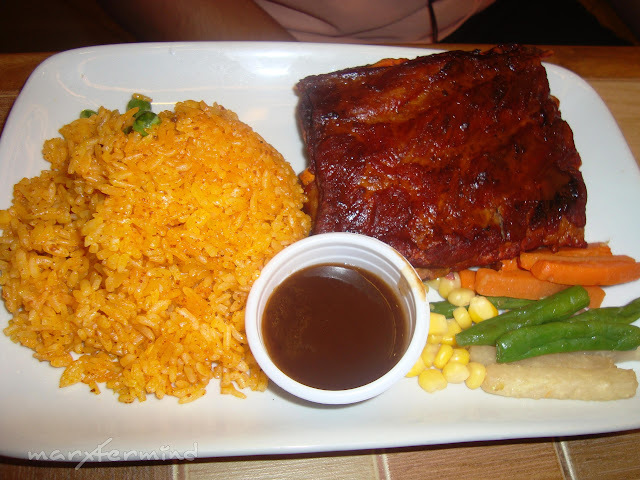 Then my office mate ordered Baby Back Ribs. I didn’t try this one anymore since I was already full. It was a good eat out experience at Buddy’s Pancit Lucban. Without any doubt, customers are coming back for its array of choices and specialties. I am looking forward to eat this pancit one more time wherein it was originated, Lucban Quezon! @pusang kalye, sa may The Link malapit sa glorietta. I think meron pa din sa Tycoon kasi nakikita ko sya pag umuuwi ako from Megamall. kakagutom tong post na to. hirap kasi kakatamad na lumabas para maghanap ng pagkain. @Hoobert the Awesome, Hardenera. Para syang menudo ang lasa. @SunnyToast, for me masarap naman pero may umay factor. na miss ko tuloy ang lucban…two consecutive years na bibisita ko ang pahiyas festival at sarap na sarap ako sa pancit hab-hab! btw…ano taste ng Hardenera? sarap ba? I guess i need to experience it. Heredera a este … Hardenera? It looks like a bread – a cupcake is more fitting – to me. LOL. Para syang stuffed menudo na nilagay sa llanera. Masarap sya pero nakakaumay din. @[pinkc00kies], sige i'll try those next time. But I want to try habhab sa Lucban mismo. @Malditang "Kura" cha, gusto ko rin makipag habhaban sa Lucban. Nung last time na nag-Quezon kami may nakita ko mga naghahabhaban sa gilid ng kalsada. Hehehe! Parang narinig ko na yang everlasting na yan! @Jeffz, Pinaka gusto ko ung pancit. Hehehe! bukod sa palabok ni jollibee at red ribbon, isa yang habhab sa favorite ko talagang pansit. Nakakamiss ang habhaban galore sa lucban. hahah! ang sagwa pakinggan. hahaha! hardinera sa marikina ata yan.. everlasting naman yung term. Love the pancit habhab too!! i also like the pancit miki bihon and chami. First time I've heard of and saw Hardenera. Ano siya?